Perfect Picture Book Friday is back for its THIRD year! (Actually, it started up again last week, when I was participating in Erik’s blog tour.) Although this book is very different to the sort of books I usually share for PPBF, I came across it while doing research for a middle grade novel, and decided the instant I read it that it would be my first PPBF pick of the season. Opening Sentences: The first time I slipped into the water with a singing humpback whale, I was not thinking about how it would change my life. Synopsis: Through photographs and detailed but easily understandable text, the reader learns about whale species, whale interaction with each other and with humans, what it is like for the author to participate in scientific studies of whales in which he gets to spend time in the water with them, photographing and experiencing them, and finally how people, both children and adults, can help preserve these magnificent creatures. The sentence after the opening sentence I quoted says that the sounds the humpback was making made the author’s bones hum. Can you imagine what an experience that would be? The photography is stunning, and the text, written in first person, allows the reader to become absorbed in the book, absorbing information almost without realizing it. There are numerous sidebars and explanatory notes as well, which add to the learning experience. 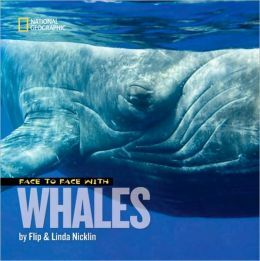 Activities/Resources: There is great information in the last few pages of the book, including a glossary of whale terminology, suggestions of how kids can help in keeping the whales’ environment clear of pollutants, and how they can educate themselves and others. There are suggestions for how to research and plan their own whale-watching adventure, either at an aquarium, or when on vacation at the ocean. There are also links to websites. There are many whaling museums, particularly along the Eastern Seaboard of the United States. If it’s not possible to visit one in person (which I highly recommend), some of them have kids’ pages on their websites. Two examples that have kids’ pages are the Cold Spring Harbor Whaling Museum on Long Island, and the New Bedford Whaling Museum in Massachusetts. Another whaling museum that I have to mention, although it doesn’t have a kids’ page on its website, is the one I have visited on Long Island, the Sag Harbor Whaling Museum. Availability: Readily available in paperback or hardcover. Announcing the WINNER of Erik’s Book! I’ll have to look for this book at our library. My kiddo likes most things in the ocean – except sharks, she does NOT like sharks – and something like this book would be good for her to read for fun and learning. Thanks for sharing. I’m not sure if feeling my bones hum would be wonderful or terrible but the book looks fascinating! I’ve never seen a whale except the ones in tanks at Six Flags or Coney Island and would love to see how they really live and act. That opening line is marvelous! I’ve been reading a ton of kids’ books about animal conservation and I would love this one. What a great opening line. Superb. I would love to visit a whaling museum; next time I am near one I’m going to make it a priority. It sounds beautiful, Beth. You often find water animal books have no kids in them, so this is refreshing. I remember how awesome it was to be up close and personal with a baby whale in Cabo San Lucas. So glad we have video footage for our family to review time and time again. Good choice! So, you are working on an MG novel too, Beth? I assume a non-fiction. . .me, too! This looks awesome. I’ve only seen them in the wild one time and it was amazing. I love the first person POV. And thanks for these GREAT links. Fabulous, and one to read alongside mine from last week. I love those opening lines, sends shivers up me! I must make a trip out to Sag Harbor to visit this museum. I saw the little National Geographic symbol and knew I would LOVE this book. Thanks for recommending it. We can see many whales here, including humpbacks, grays and even blues. This would be a great resource for a whale-watching trip. This is a great book. I have seen it before and it would be popular here, as while whale watching is a tourist attraction on the east coast of our South Island, they are also seen up as far as here in the North Island. I am a sucker for books and movies about whales — especially Humpbacks and Orcas. Saw a few in Alaska. I love their singing. Great selection because I think all kids have a love for whales. And, this is a great book to share with kids. Wow! Swimming with whales. Makes me shiver. I love swimming. But I’ve never met a whale. They seem to be somewhat serene animals. You have some fun activities. thanks for sharing!